For many investors, bond maturity ladders are a good way of mitigating duration or interest rate risk. But they also have a very important application for retirees in pension phase, which can help deal with sequencing risk. An all too common problem for retiree portfolios is that they’re dominated by equities, with some cash for rainy days. When a significant downturn occurs and dividends are cut, retirees can be forced to sell equities, eating into their capital. Imbedding a bond maturity ladder at the heart of retiree portfolios can negate this risk, allowing retirees to live off bond returns that are stable. This allows time for their equities to recover, being the number of years the bond ladder runs for. Last year I had the honour of presenting to an investor club in Melbourne for older Australians. Formed in the 1950s, some of the members were well into their 80s and 90s. My talk was “Own your age in bonds”, a phrase coined by Vanguard founder John Bogle. The 92-year-old compere quipped afterwards that he had it wrong, and was 92% invested in equities. Laughs all round, but it’s a common picture in Australia. It’s what you could call the retiree’s dilemma. Australian investors have loved their equities for generations for good and ill. Many retirees and other investors have the classic imbalanced scales of equities and cash, with nothing in between. 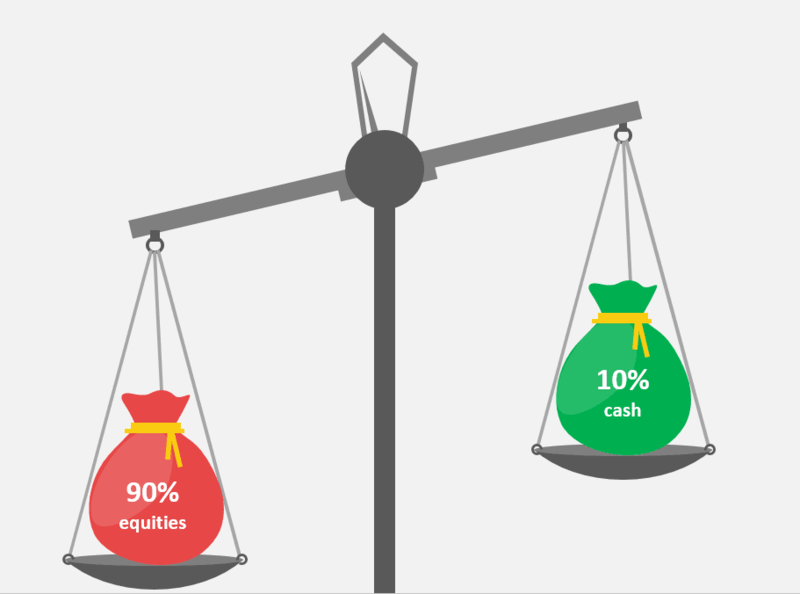 For many investors, it’s as much as 90% equities with some cash for rainy days. While dividends are maintained then all’s well. But panic sets in when markets collapse and dividends are cut. Think BHP two years ago and what might be for Telstra in the years ahead. If you don’t have sufficient rainy day cash, you could end up having to sell depressed equities to fund your living. Rather than preserving capital, you’d then be spending it. This is known as “sequencing risk” – the risk the timing and sequence of cash flows is hit by a downturn. If you are in drawdown phase, this can cause damage you may not recover from. Structuring your portfolio using both bonds and equities can help to manage this risk. A bond maturity ladder portfolio to live off. Corporate bonds generally yield more than term deposits¹, so this split can provide better returns than equities plus cash. Bond maturity ladder portfolios comprise bonds that mature at regular intervals. For example, a seven-year ladder portfolio will contain one bond maturing each year over the next 7 years. Maturity ladder portfolios can be beneficial to investors both in retirement and before retirement. Scenario: Your portfolio is well diversified across shares and bonds. You like the yield of a specific seven-year bond, but you’re concerned about rate rises (where bond prices fall). You know if you hold the bond to maturity there’s nothing to be worried about – your YTM would be locked in. But, seven years is a long time so it’s sensible to be concerned for longer-dated bonds. This is where a maturity ladder portfolio becomes useful. 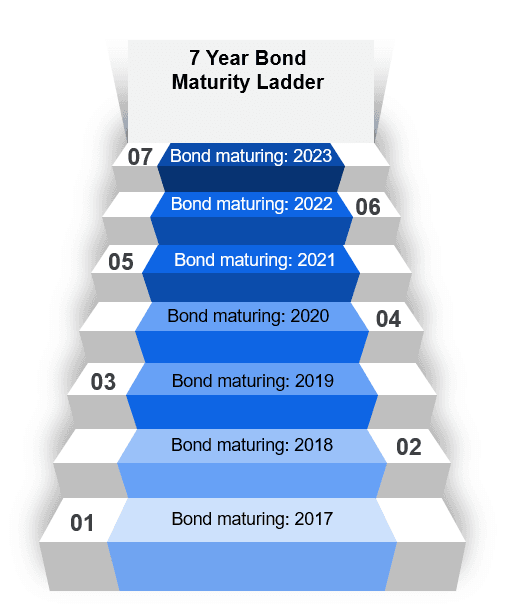 You buy a ladder of seven different bonds with one maturing each year. This reduces interest-rate risk, compared with investing everything in the seven-year bond. This is because bonds are more sensitive to rate increases the longer dated they are. As bonds mature each year, you reinvest the capital in the next seven-year bond, and so on. Your bond ladder keeps rolling. If there is a yield increase, as you feared, it’ll have the least impact on the maturing bond. In fact, the bond matures at $100 irrespective of the yield increase. You reinvest this in a new 7-year bond, with the added benefit of this new bond being cheaper now, because yields have increased. This holds true even if yields increased significantly. The par value ($100) of the maturing bond isn’t impacted and the new longer bonds are cheaper. This provides you with the protection from the rate rise you feared. In our 7-bond example, if yields rose 1% in a year, the unscathed capital from the maturing bond buys new 7-year bonds. Their duration of approximately seven means they are about 7% cheaper (7*1%). For retirees, a bond ladder provides a stable way to provide predictable living expenses. Scenario: Assume your view is equities will recover within 7 years of any major downturn. You invest in a 7-year ladder with the rest in equities. You can live off the dividends, the bond coupons, plus the maturing bond capital. Equities tumble 40% and dividends are cut. Remember, we have corrections. They’re real. They happen. Rather than panic selling equities to fund your lifestyle – you do nothing because you have seven years for equities to recover. Your bond income and capital is locked in for this period. Only a default will affect this and as you’ve selected bonds from investment grade issuers in the ASX100 then the chances of a default are low. In this example, you are consuming the bond’s capital as well as the income. To keep your ladder rolling, you could sell some of your equities to buy a new bond as each bond matures. You still have equities to provide growth opportunities. But you now have a stable bond ladder in the heart of your portfolio. This funds your lifestyle and helps you sleep at night. Effectively you are swapping part of your volatile equities for capital stable, 100% predictable investment grade corporate bonds. It’s important to remember that this only works with holding bonds or XTBs directly. The strategy does not work with ETFs or managed funds because they do not mature, so there’s no capital repayment. Plus, ETFs and managed funds can’t provide income predictability because their portfolios constantly evolve over time. If equities only take 4 years to recover, then you aren’t impacted. You will have the exact level of income you knew you would have when you bought your bond ladder portfolio. Your coupons and capital are locked in, assuming the company doesn’t default. These outcomes can be achieved outcomes using XTBs over investment grade corporate bonds on ASX. View the range of Available XTBs to start building your maturity ladder portfolio.